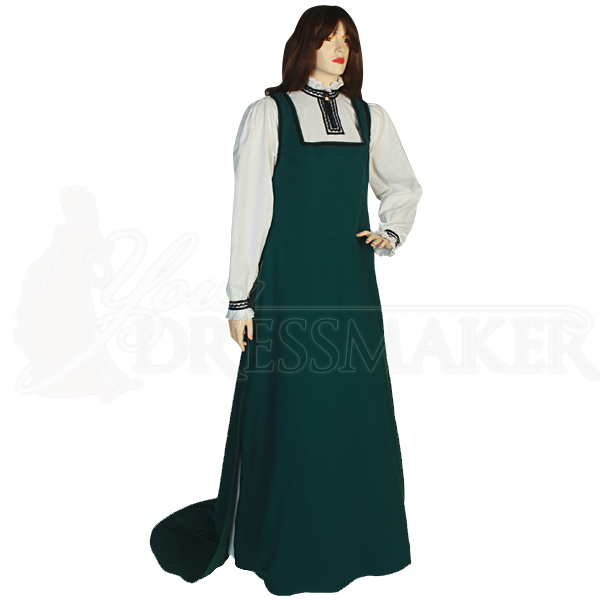 The Medieval Pinafore Dress is a two piece set including a loose fitting chemise and a fully lined overdress, ideal for achieving a layered, historic-inspired look. This lovely ensemble is made from 100% cotton and is available in a variety of color options. The loose fitting chemise features a high ruffled neck and long sleeves with a ruffled cuff, both decorated with ribbon and fabric trim that match the outer pinafore-style dress. This outer dress is available with or without a short train, for an extra touch of effortless elegance if you desire. 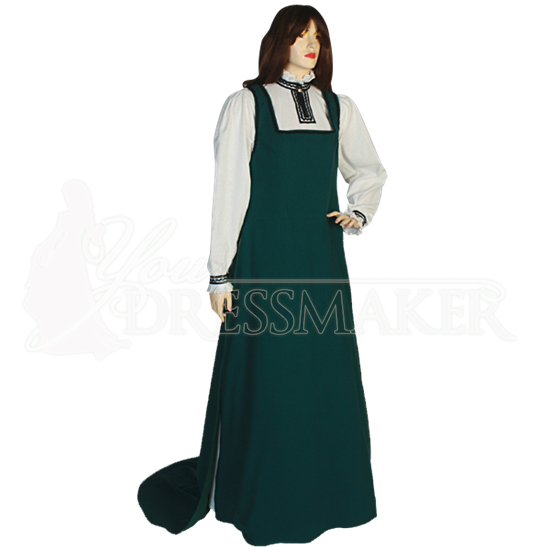 Comfortable, easy to wear, and extremely versatile, the Medieval Pinafore Dress is an essential addition to any reenactors wardrobe, well suited for a variety of historic reenactment themes, Renaissance festivals, and LARP events. When ordering, the first Color dropdown menu is for the main color of the dress. The Chemise Color is for the underdress. The Accent Color is for the decorative trim. Wash gently with cold water and a gentle cleaning agent, using a half load on a short spin cycle. Water temperature should not exceed 85 degrees Fahrenheit. Lay flat and air dry.